In a bowl large enough to hold both slices of salmon, mix the sliced ginger and garlic with the ginger syrup, the orange juice and the soy sauce. Add in the orange zest and the freshly ground the black pepper. In case you cannot source the ginger in syrup, fresh ginger can nicely replace it. In this case, add a couple of tablespoons of unrefined sugar. Put the salmon in the bowl with the marinade. Turn a couple of times, ending with the fish skin side up. Cover and let it sit in the fridge for about 30 minutes. Preheat the oven to 220oC. Line a small baking tray with baking parchment. Take the salmon fillets out of the marinade, scraping off any bits and pieces, and place them on the tray, skin side down. Season with more ground black pepper. Bake for 12 – 15 minutes, depending on the thickness of the salmon. Meanwhile prepare the sauce. Pour the marinade into a tiny non-stick pan and bring to the boil. Cook for 6 minutes or until the liquid has reduced to half and the garlic is softened. 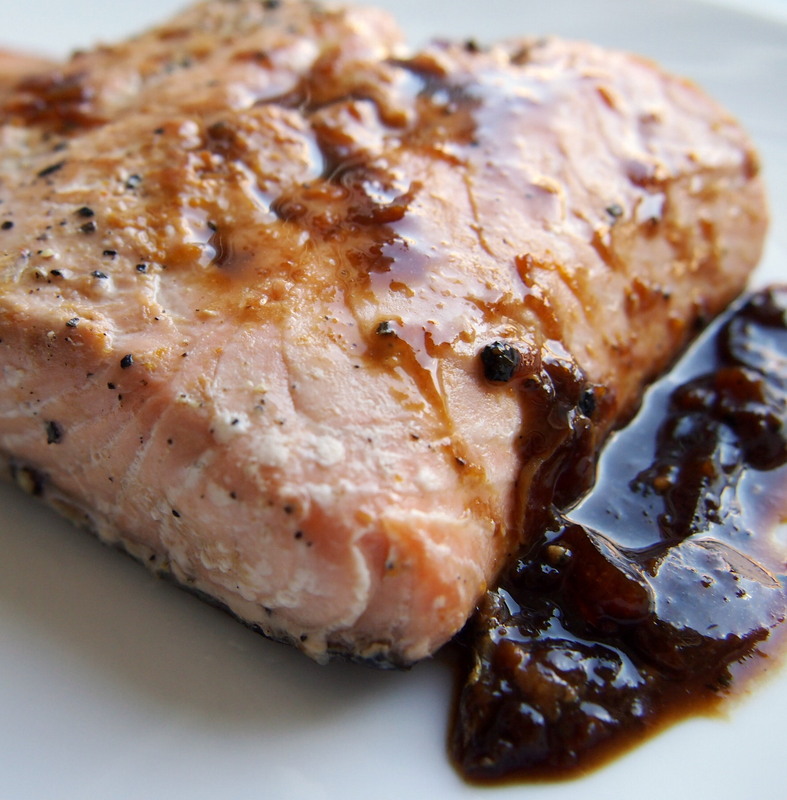 Put the salmon fillets on warm plates and spoon over with the sauce. Be careful not to damp the fish with the sauce. Serve immediately. If you are about my age, and studied organic chemistry, there is a very big chance one of your lab practices was the synthesis of anisaldehyde, a chemical compound which is found in anise, tastes like licorice and smells of sweet almonds. I don’t recall it as being excessively difficult, but what made this lab memorable was the strong aniseed smell of the whole experiment. It was like a haze that would stay with you for a couple of days, and sort of thing that would put you off of anything that might resemble it. For example, licorice, almond oil or even amarguinha, a Portuguese almond liqueur. Later, in my short (but intense) academic career, I ended up using anysaldehyde in my experiments for a good 4 years. It still smelled the same, and it still would give me headaches. Needless is to say, my motivation for using anything that might be slightly aniseed was almost non existing. But, one day I took a picked a bit fennel salad in a buffet. And, much to my surprise, it tasted good. It was crunchy, fresh and it had a slight taste of anise, that just made it a bit more interesting. A vegetable you could see in a salad during Summer, or in a more autumnal roast. Or, all year round paired with fish – a combination of flavors made in heaven. 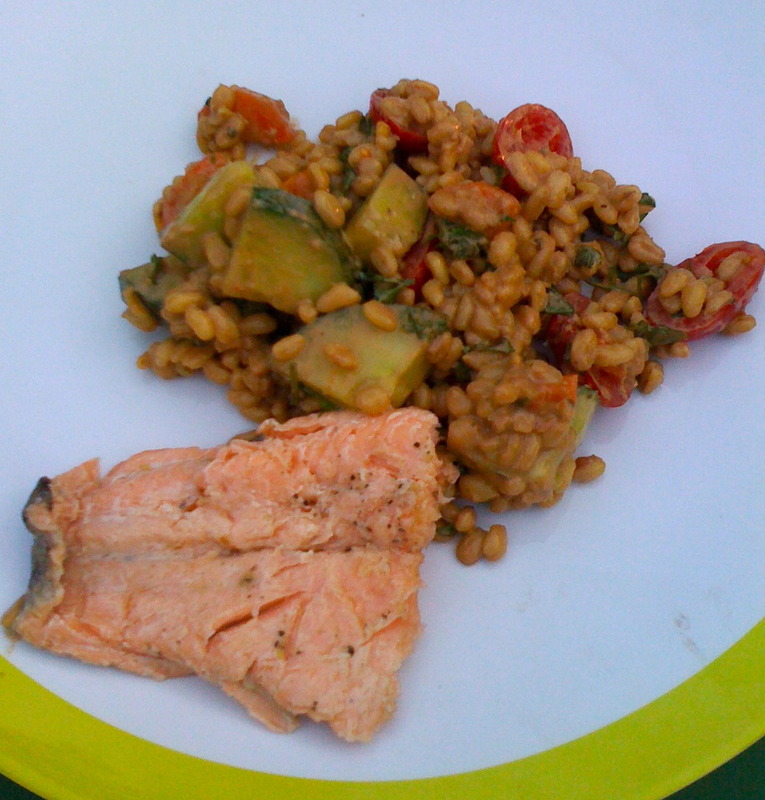 The recipes of salmon-cherry tomato-fennel are ubiquitous. For this dish, I turned to BBCGoodFood, for no special reason other than being a todpop‘s favorite. Heat oven to 180C/fan 160C/gas 4. Trim the fronds from the fennel and set aside. Cut the fennel bulbs in half, then cut each half into 3 wedges. Cook in boiling salted water for 10 mins, then drain well. Chop the fennel fronds roughly, then mix with the parsley and lemon zest. 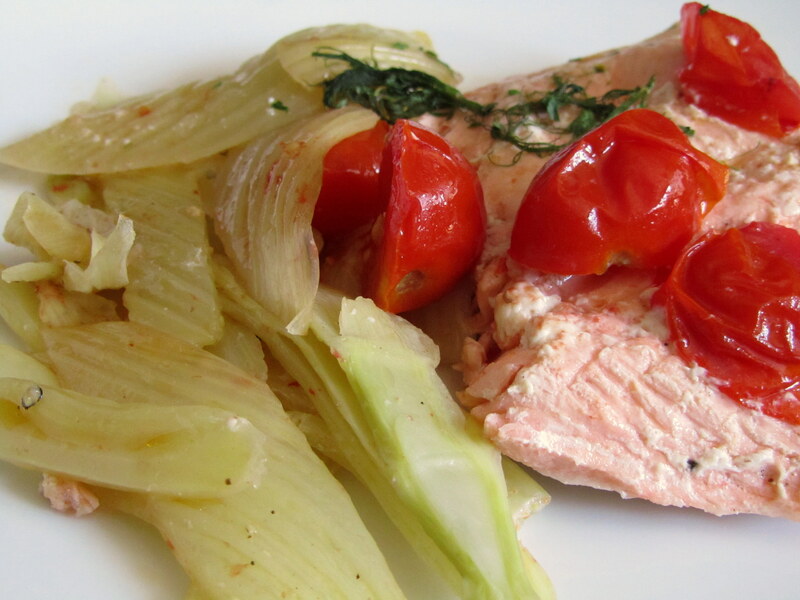 Spread the drained fennel over a shallow oven proof dish, then add the tomatoes. Drizzle with olive oil, then bake for 10 mins. Nestle the salmon among the veg, sprinkle with lemon juice, then bake 15 mins more until the fish is just cooked. Scatter over the parsley and serve.